As much as intrepid is the name of our blog, it has also become a bar by which we measure ourselves. A reminder to be brave and do things out of the ordinary. Despite this, I just couldn’t get my head round the idea of the 30+ hour journey it would take us to reach Laos from Vietnam. And so we flew to Thailand. We had a couple of pleasant days in Bangkok before heading North for our elephant rendezvous. Our hotel was on a quiet soi (lane) not too far from Khao San road. After securing our train tickets at the station we joined the backpacker throng on the infamous street. The boys tucked into scorpion and declared it much tastier than in Beijing. We partook in a fish spa but resisted the urge to get a tattoo or buy elephant pants. The following day we had a date with a lovely Thai man, Earth, who we had met trekking to Annapurna Base Camp back in November. 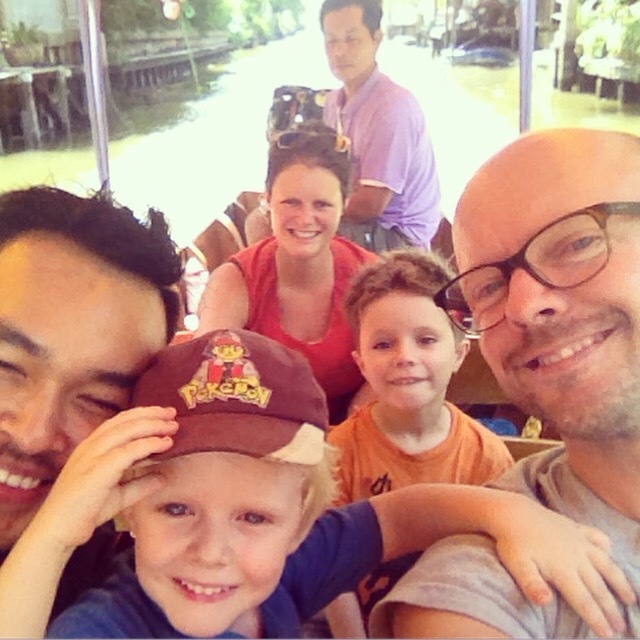 We enjoyed his narrative as we sped around Bangkok’s canals on a long tail boat. Afterwards, he took as to a local eatery that has been in the same location for 40 odd years. We left the ordering up to Earth and sampled a range of authentic Thai dishes – delicious! 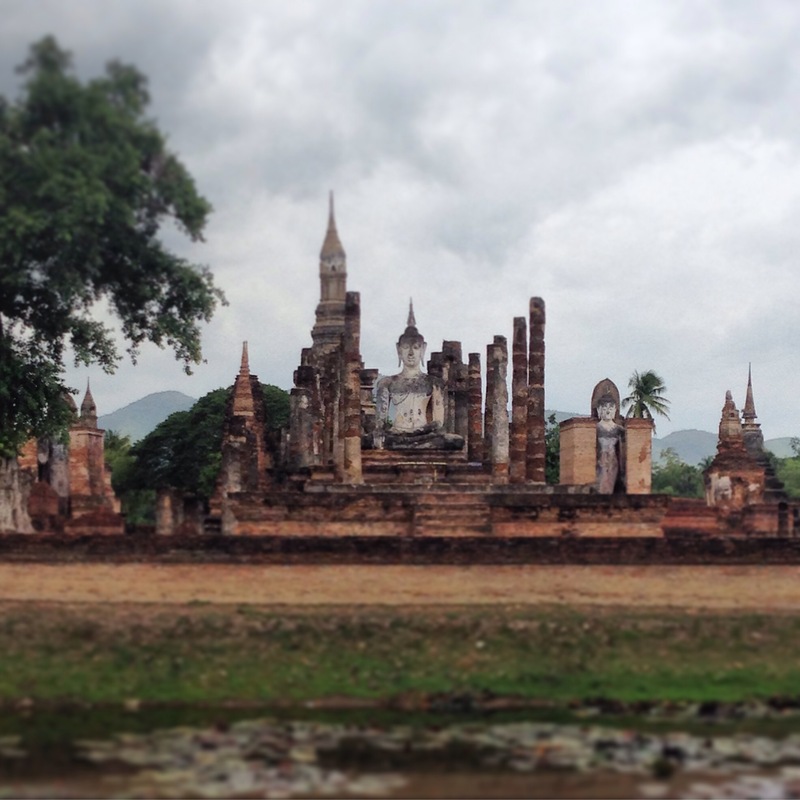 After our wonderful visit to Boon Lott’s Elephant Sanctuary we headed to Sukhothai for a dose of ancient temples. We hired bikes and cycled round the historical park. This UNESCO world heritage site was built around 800 years ago and is similar in style to Angkor Wat. We had fun playing hide and seek amidst the ruins. That evening we enjoyed some tasty food near the market. Our food stall of choice shared their seating area with the local mechanic and we chowed down our noodle soup under the hydraulic lift. We took a bus up to Chiang Mai. The five days we had there flew by and we could have easily spent longer. We had some wonderful food and met some wonderful people. The boys highlight was definitely our visit to the Siam Insect Zoo where we got up close and personal with all manner of bugs. George and I even held a scorpion! I decided to treat myself to some RnR and went for a Thai massage. Despite going for the ‘relaxing’ option, it was agony and I would hate to experience a ‘strong’ one! We really enjoyed walking around the old town and even dragged the children kicking and screaming persuaded the children to visit a temple or two. We were thrilled with the sleeper train back to Bangkok. The bunks start the journey as seats and are converted about hour into journey, complete with sheets, blankets and comfy pillows. We were in lower bunks and they were pretty roomy, even sharing with a small wriggly child. It was best sleep on a night train we’ve ever had. We split our last couple of days in Bangkok between doing something for the adults and something for the children. 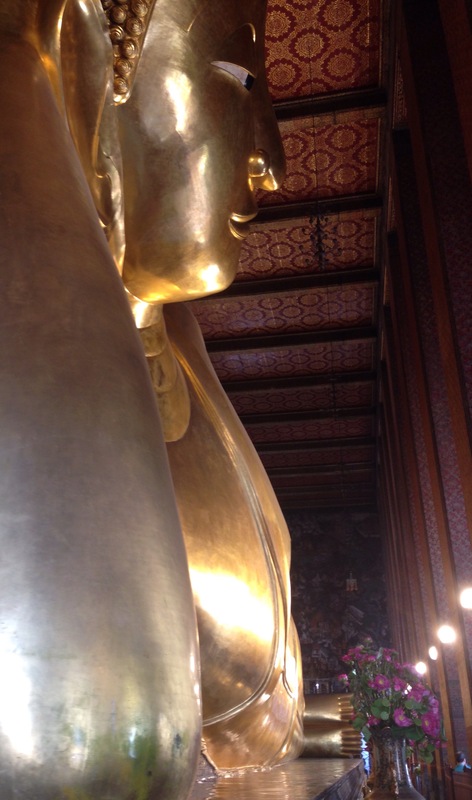 The grown ups chose a visit to see the massive golden Buddha at Wat Pho (My brain is still processing this as it would in Vietnam – what fer?). The boys were in a cooperative mood and we discussed the various merits of Wat Pho’s Buddha versus the giant one we’d seen at Leshan in China. We’d taken their sketch books and they were happy to sit by the pond drawing the fish. For the children we went to KidZania the following day. A miniature city where the children get to dress up and role-play different jobs. They got to be firefighters, riding on a mini fire engine to put out a fire. They looked for a missing person whilst being police officers. They were vets, doctors, 7eleven cashiers and even took part in a stage production of the Little Mermaid. 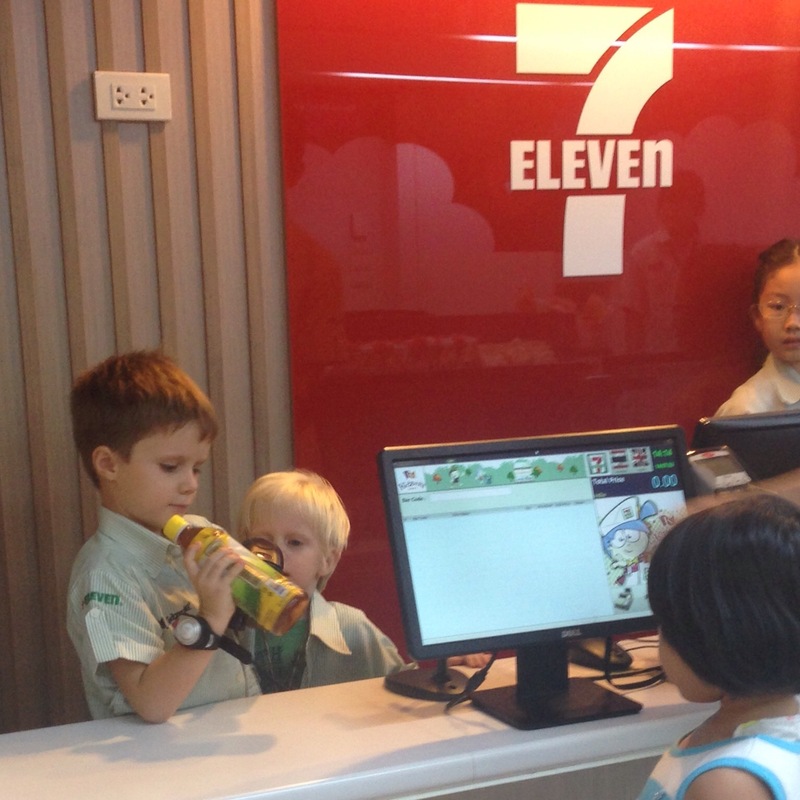 They earn kidzos for their endeavours and can spend them on other activities such as making a drink at the coca-cola bottling plant or having a good old boogie at the disco. There is also a department store where they are supposed to be able to by items with their hard earned kidzos but they all cost too much. A life lesson too far perhaps. The boys however had lots of fun. It is very clever marketing for the companies involved, an exercise in brand recognition and capitalist brain washing for the next generation of consumers. This was not our first visit to Thailand and I’m pretty sure it will not be our last. The country is beautiful and the people friendly. It is easy to get around (apart from Bangkok where the traffic is awful) and the food, as you may have gathered, is amazing. We were happy and well fed for the long road to Cambodia.